Western Germany was part of the Roman Empire, which just beyond the Rhine. Trier in the Mosel valley has more Roman structures than any other city north of the Alps - including Constantine’s Basilica from around 300 AD. Aachen, by the Belgian border, has buildings telling the story of the ‘Holy Roman Empire’, an attempt by the Emperor Charlemagne in around 800 to unify Christendom. Aachen was his capital. The Eiffel region between Aachen and Trier has rugged scenery and pretty villages with half-timbered buildings. Beautiful countryside can be found on a cruise up the Rhine valley, wooded, with small villages and ruined castles. Start at a Cologne hotel - or at the station at 9.14 a.m., meeting you off the 8.10 a.m. train from Frankfurt-am-Main. We’ll tour the stunningly high cathedral, then drive 40 minutes down near the Rhine to Bad Honnef for a guided tour of the home of Konrad Adenaeur, the first Chancellor of postwar West Germany (1949-63). Great views over the Rhine valley. 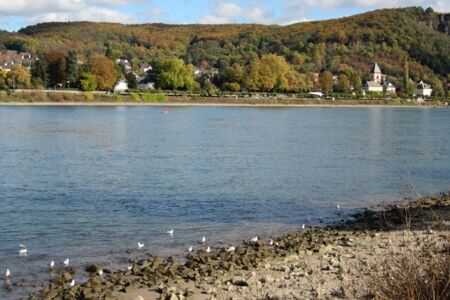 After a lunch break, we’ll cross the Rhine by ferry to visit the site of the Bridge at Remagen, where US troops became the first across the Rhine on 7 March 1945. Drive 30 minutes north to Bonn: to the modern Museum of Contemporary German History which tells the story of Germany from 1945 to the present day - a great short introduction. Check-in to hotel and short walking tour of city centre (capital of West Germany 1949-99; birthplace of Beethoven). Drive one hour west to Heimbach, a village at the start of the rugged Eiffel region. Coffee here, then we’ll drive up into the hills: view over the huge lake behind the Schwammenauel Dam, into the Hurtgen Forest for a short forest walk to see a huge German bunker from their World War II ‘Siegfried Line’ defences. Into the pretty Eiffel town of Monschau for lunch. Two hour drive out of the Eiffel and into the Mosel valley to Trier. Check-in to our hotel, and short introductory walking tour. Walking tour of Trier taking in the stunning Romanesque Cathedral that incorporates old Roman buildings; the Roman amphitheatre and the baths; Roman city walls; and the huge Basilica built for the Emperor Constantine around 300AD! We’ll end with the huge city gateway, the Porta Nigra. After lunch we’ll drive one hour down the Mosel valley alongside its vineyards to the small river town of Bernkastel-Kues. After enjoying the views here we’ll pick up the autobahn for a 1 hour 20 minute drive to the end point of our tour - Koblenz, where the Mosel flows into the Rhine at Deutsches Eck (German Corner) with a grand statue of Kaiser Wilhelm I. Trains to Frankfurt leave at 5.04 p.m., arriving at 6.51 p.m. This tour could be adapted to start/finish at a Frankfurt hotel if the tour involves a minibus/coach - it is an approximately 2 hr drive to our first site and 1 hr 30 minutes back from Koblenz at the end. It is also possible to a link to Eurostar travel from the UK - by Eurostar to Brussels and changing to ICE train to Cologne - but you would need a hotel night in Cologne before and after the tour. Start at a Frankfurt hotel (or the airport) and drive 1 hour south to Speyer. Coffee break and a visit to Speyer Cathedral from the 11th century - a Romanesque masterpiece; four Holy Roman Emperors and four German kings are buried in its Royal Vault. Drive1 hour north to Mainz - tour taking in the Gutenberg Museum which commemorates the city as the place where printing was introduced in Europe (Gutenberg invented moveable type in the 1400s), and the Cathedral with its 20th-century windows by Chagall. Cross the Rhine for an overnight stay in the wine-town of Rüdesheim. Catch the 9.15 a.m. cruise boat downstream for a three-hour Rhine cruise during which you’ll pass many fine cliff-top castles, villages such as Bacharach and Bingen, and the cliff of Lorely that features in many Rhine legends. English commentary; restaurant aboard for early lunch. Get off at Braubach at 12.20 p.m. - drive up the hill to Marksburg Castle above. Tour of this the only Rhine Valley castle not to have been destroyed. 20 minute drive into Koblenz to see Deutsches Eck (German Corner) where the Mosel flows into the Rhine. Then 40 minutes up the west bank of the Rhine to the site of the Bridge at Remagen, where U.S. troops became the first across the Rhine on 7 March 1945. Drive 1 hour 30 minutes to the Zollverein complex at Essen in the heart of the Ruhr industrial district. The Zollverein includes a coal-mining museum, a museum about the Ruhr, and Norman Foster’s Red Dot Design Museum. Mid-afternoon we’ll drive 1 hour 15 minutes back to Cologne for a walk in the city centre to visit its staggeringly high cathedral (walk up one of the towers for the sporty!). 2 hr 15 minute drive back to Frankfurt - or just 1 hour by ICE train direct from Cologne station, right outside the Cathedral.